Wellens syndrome is a pattern of deeply inverted or biphasic T waves in V2-3, which is highly specific for a critical stenosis of the left anterior descending artery (LAD). Patients may be pain free by the time the ECG is taken and have normally or minimally elevated cardiac enzymes; however, they are at extremely high risk for extensive anterior wall MI within the next few days to weeks. Due to the critical LAD stenosis, these patients usually require invasive therapy; do poorly with medical management; and may suffer MI or cardiac arrest if inappropriately stress tested. 1979 – Gerson et al first described the occurrence of exercise-induced U wave inversion (inverted terminal T-waves) in the precordial leads in patients with proximal left anterior descending artery (LAD) ischemia. 33/36 patients (92%) with this abnormality had >75% stenosis in the proximal LAD. 1980 – Gerson further evaluated ‘U-wave inversion‘, this time at rest, and found 24/27 (89%) of patients with the ECG findings had evidence of LAD or left main ischemia. 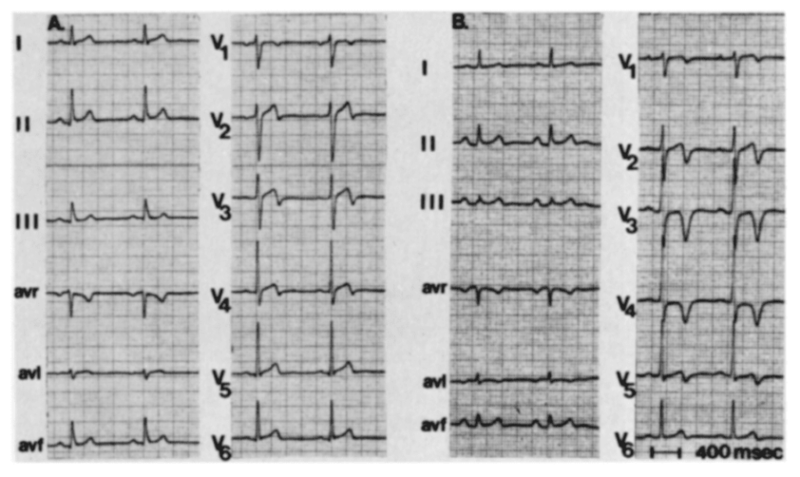 1982 – De Zwaan, Wellens et al reported a similar ECG abnormality without mentioning inverted U-waves. They observed that patients admitted for unstable angina with this ECG finding were at high risk for myocardial infarction. T wave changes can evolve over time from Type A to Type B pattern (Smith et al). There is confusion in the literature regarding the naming of the T wave patterns, with some authors using Type 1 (Type A) for biphasic T waves and Type 2 (Type B) for inverted. It may be better to just describe the T wave pattern! **Classification of Wellens ECG patterns, from the original paper by de Zwaan C, Bär FW, Wellens HJ. Characteristic electrocardiographic pattern indicating a critical stenosis high in left anterior descending coronary artery in patients admitted because of impending myocardial infarction. Am Heart J. 1982 Apr;103(4 Pt 2):730-6. A sudden occlusion of the LAD, causing a transient anterior STEMI. The patient has chest pain & diaphoresis. This stage may not be successfully captured on an ECG recording. Re-perfusion of the LAD (e.g. due to spontaneous clot lysis or prehospital aspirin). The chest pain resolves. ST elevation improves and T waves become biphasic or inverted. The T wave morphology is identical to patients who reperfuse after a successful PCI. If the artery remains open, the T waves evolve over time from biphasic to deeply inverted. The coronary perfusion is unstable, however, and the LAD can re-occlude at any time. If this happens, the first sign on the ECG is an apparent normalisation of the T waves — so-called “pseudo-normalisation”. The T waves switch from biphasic/inverted to upright and prominent. This is a sign of hyperacute STEMI and is usually accompanied by recurrence of chest pain, although the ECG changes can precede the symptoms. If the artery remains occluded, the patient now develops an evolving anterior STEMI. Alternatively, a “stuttering” pattern may develop, with intermittent reperfusion and re-occlusion. 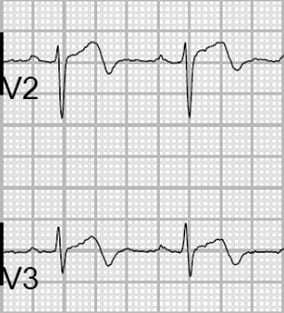 This would manifest as alternating ECGs demonstrating Wellens and pseudonormalisation/STEMI patterns. This sequence of events is not limited to the anterior leads — similar changes may be seen in the inferior or lateral leads, e.g. with RCA or circumflex occlusion. Also, the inciting event does not necessarily have to be thrombus formation: Wellens syndrome may also occur in normal coronary arteries following an episode of vasospasm, as in this case of cocaine-induced vasospasm. However, it is safer to assume the worst (i.e. critical LAD stenosis) and work the patient up for an angiogram. The concept of occlusion/reperfusion/re-occlusion is explained by Dr Stephen Smith. Also check out Example 5, below. Biphasic precordial T waves with terminal negativity, most prominent in V2-3. 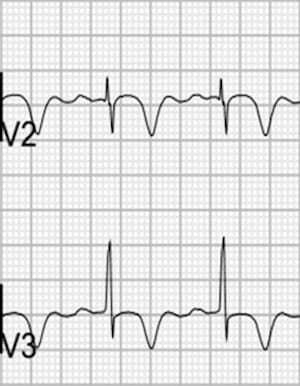 The biphasic T waves in V2-3 are characteristic of Wellens syndrome. There are deep, symmetrical T wave inversions throughout the anterolateral leads (V1-6, I, aVL). Biphasic T waves with minimal ST elevation in V1-5, consistent with Wellens syndrome. The patient had experienced ischaemic chest pain immediately prior to arrival in hospital and was pain free at the time the ECG was taken. This prehospital ECG was taken while the patient was still symptomatic with chest pain and diaphoresis. It shows unmistakable features of anterolateral STEMI, with marked precordial ST elevations and inferior reciprocal change. The symptom resolution and conversion to a Wellens ECG on arrival to hospital indicates reperfusion of the LAD. 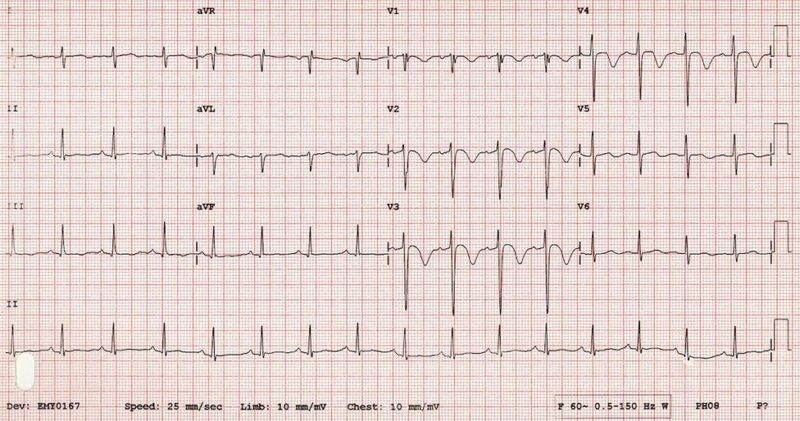 This fantastic ECG series (submitted by paramedic Andrew Bishop) shows a stuttering pattern of LAD occlusion, reperfusion and re-occlusion in a middle aged lady with chest pain. The ECGs are presented in chronological order, over a 45 minute period from the prehospital environment to the cath lab. 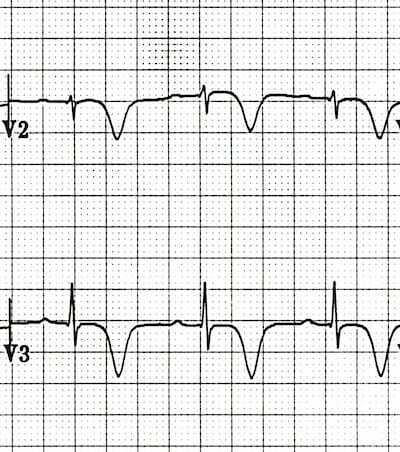 The ECG shows a clear anterolateral STEMI, with inferior reciprocal change. The artery is occluded at this point. The ECG now shows a typical Wellens pattern of biphasic T waves in V2-3, plus improvement in the anterolateral ST elevation. This indicates spontaneous reperfusion of the LAD — i.e. the artery has re-opened. With recurrence of pain there is pseudo-normalisation of the precordial T waves: the previously biphasic T waves have become prominently upright (= “hyperacute” T waves). 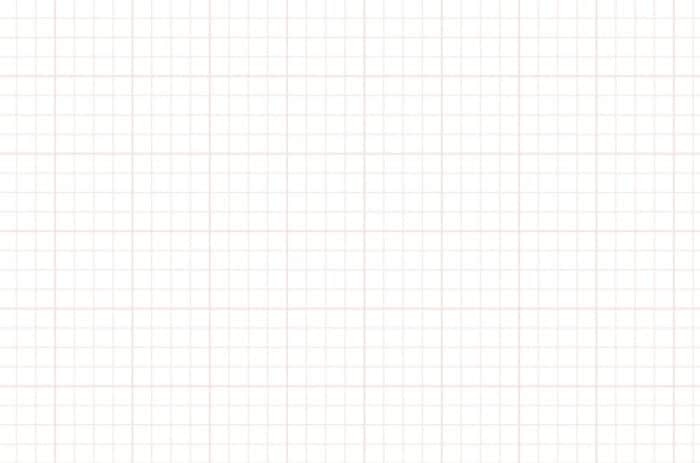 This apparent normalisation of the T waves indicates re-occlusion of the LAD artery. Following re-occlusion of the artery, there is further evolution of the anterolateral ST changes, with evolving anterior STEMI. Once again there is reperfusion of the artery, only this time the ST changes are slower to resolve. Now the T waves are starting to become biphasic again (Wellens Pattern A). Shortly after this series of ECGs was taken, this patient suffered a VF arrest that was refractory to defibrillation. She was placed on a mechanical CPR device and taken to the cath lab, where she was found to have a 100% proximal LAD stenosis. This was stented, she was successfully cardioverted and subsequently made a good neurological recovery! Explore the links above to appreciate the similarities and differences between these ECG patterns. 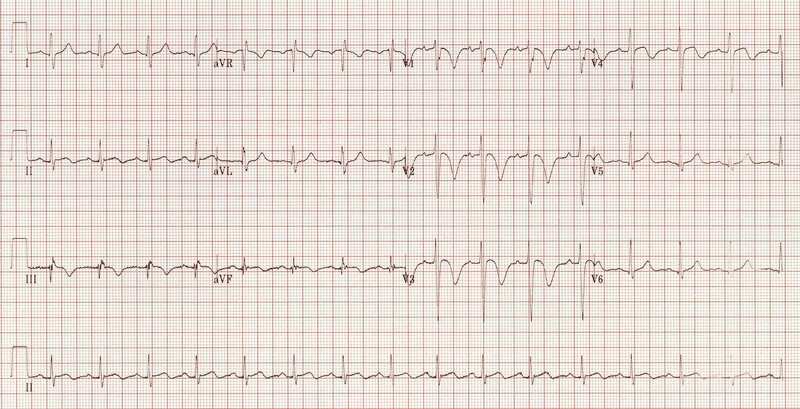 This ECG was initially posted as an example of Wellens syndrome. What do you make of it? As ECG expert Steve Smith from Dr Smith’s ECG Blog pointed out in a recent email to me, this ECG is more consistent with a diagnosis of pulmonary embolism! Apologies for the misinformation… As you can see, these two conditions can be difficult to tell apart! The pattern of inverted and biphasic T waves is different to Wellens syndrome, affecting multiple leads (i.e. any lead with a tall R wave) rather than V2-3. In this case, the Wellens-like T waves are just a variant on the repolarisation abnormality (LV “strain”pattern) that is seen with LVH. Is most commonly seen in the lateral leads (V5-6, I, aVL). Typically occurs in patients with high QRS voltages, e.g. due to LVH, or in young black males with benign early repolarization. Consolidate your learning with lessons from the masters of ECG interpretation. 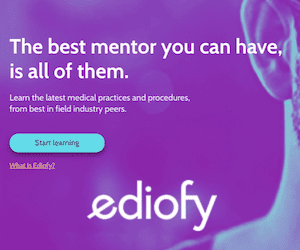 Follow the links below for expert commentary, video lessons, case-based discussion and detailed explanations to take your learning to the next level. 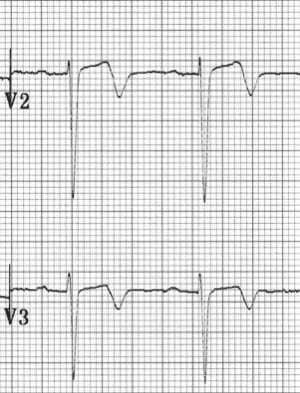 ST elevation in aVR — a sign of LMCA occlusion? Doevendans PA, Gorgels AP, van der Zee R, Partouns J, Bär FW, Wellens HJ. Electrocardiographic diagnosis of reperfusion during thrombolytic therapy in acute myocardial infarction. Am J Cardiol. 1995 Jun 15;75(17):1206-10. PubMed PMID: 7778540. Haines DE, Raabe DS, Gundel WD, Wackers FJ. Anatomic and prognostic significance of new T-wave inversion in unstable angina. Am J Cardiol. 1983 Jul;52(1):14-8. PubMed PMID: 6602539. Rhinehardt J, Brady WJ, Perron AD, Mattu A. Electrocardiographic manifestations of Wellens syndrome. Am J Emerg Med. 2002 Nov;20(7):638-43. PubMed PMID: 12442245. Tandy TK, Bottomy DP, Lewis JG. Wellens syndrome. Ann Emerg Med. 1999 Mar;33(3):347-51. Review. PubMed PMID: 10036351. Wehrens XH, Doevendans PA, Ophuis TJ, Wellens HJ. A comparison of electrocardiographic changes during reperfusion of acute myocardial infarction by thrombolysis or percutaneous transluminal coronary angioplasty. Am Heart J. 2000 Mar;139(3):430-6. PubMed PMID: 10689257.